On 19 May 2017 Minister of State at the Department of Foreign Affairs and Trade, Joe McHugh TD, spoke at the Council of the European Union in Brussels. He addressed European Ministers at the Foreign Affairs Development Council. Minister McHugh made a number of pertinent interventions, including stating that sustainable development cannot be realised without justice and peace. 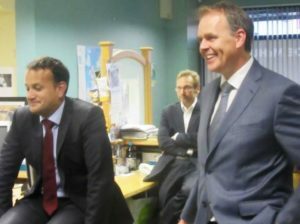 The Irish Minister drew on his knowledge of projects he believes offer a shining example of transformational hope in the Developing World. High on his agenda was his reference to the Shalom Project, founded by SMA missionaries, Fr Ollie Noonan and Fr Padraig Devine. Minister McHugh gave a short interview immediately after the Foreign Affairs Development Council in which he, again, makes reference to the work of the Shalom Project especially in Northern Kenya which he personally visited earlier this year. Minister McHugh (front, 2nd left) in group photo with Irish Delegation on visit to Shalom Project in northern Kenya. “This was an opportunity for us as a country to give our ongoing commitment to many of the crisis that there are, especially in the Horn of Africa. It was also an opportunity for me to acknowledge the host countries in the Horn of Africa who deal with large numbers of refugees. But on top of that we were focused on our sustainable development goals. We are very focused on – in line with António Guterres as well – at how we can look at and examine the root causes; looking at peace and reconciliation; to looking at how we can bring peace which will obviously lead to sustainable development. We can’t have sustainable development without peace. And I also pointed to the great work that is being done in Northern Kenya by a group called Shalom – interethnic conflict reconciliation – where for the first time in a particular region, even with drought and massive challenges, peace is holding. So we have to look at the solutions. My message today from Ireland to Europe was – if there are examples that are working we should look at them, we should support them, and we should also look at our own experience. Minister McHugh’s comments are available to view on the homepage of this website. Or you may also view them by clicking here. António Guterres comments on link between peace and sustainable goals can be accessed by clicking here. Previous articleNew SMA website to be launched next Tuesday!